inevitable to help sustain the daily valuable ration. In NEKTON-Natural-plus we follow a complete new and meaningful supplementary concept, that besides the naturally occurring nutrients and active agents, especially the natural substances are being sustained, which the science refers to as „secondary plant substance“ or „bioactive substance”. In addition, these vital substances support a plain nourishment function (such as energy and nutrient carrier), adding a positive effect to the well being or wellness, for a better digestive and energy recovering process in organism, therefore also as a guard against negative external influences. The effect of the bioactive substances apply accordingly as well examined on various animals and the findings being transferred to humans. The transfer of pre-established evaluation from an animal species to another within biological consideration is absolutely possible, because all animal cells (including humans) and organic tissues operate the same in the animal kingdom. Because of its support optimizing the natural cell conservation it becomes part of the “age defying” complex process. Yeast in fine powder form supplements with valuable amino acids the protein spectrum of staple diet. Added furthermore are the natural concentrated B-complex vitamins and positive dietary fiber off the yeast-cell-wall. Girasol (wrongly known as Jerusalem-Artichoke) it self- displays for the high concentration of Fructan-Prebiotica; in foreground from girasol in the powder is the substance inulin, promoting positively the intestinal bacteria. The seaweed Ascophyllum offers besides the valuable sea minerals and micronutrient iodine’s also probiotic „dietary- fiber“from the cell-walls especially the so-called Glucan. These too “feed” to “the good” intestinal bacteria. Asparagus self-displays through its high nature content of the desirable Fructooligosaccharide (FOS), also a motivator of the intestinal occupants and therefore with Pre- or Probiotica affiliated. Same true for the leek; we added to its high valuable FOS effective essential oils, fragrance and flavor additives, that together with the Asparagus flavor is energizing the digestive juice. Tomato and carrots offer with their Carotinoide (Lykopin und ß-Carotene) true cell guard’s radical capturer and natural antioxidants for the „anti-aging“process. The bittern of the artichoke supports the protection of the liver, as well seizes and promotes directly the bail flow of the gall bladder. Paprika powder serves in the recipe as a tonic stimulating digestives through its special essence oils, polyphenol and light riot agents. The diverse organic elements and cell-effect-system of the fatty acids are as well becoming more familiar and popular even though skin and coat stay in focus. But much other functionality can be observed especially in the combination of omega 3 and omega 6 fatty acids with an adding of Omega-9-fatty acids part. For the cat taurine, an essential amino sulfa acid, for the dog carnitin, are the natural materials featuring support in the process of catabolism. 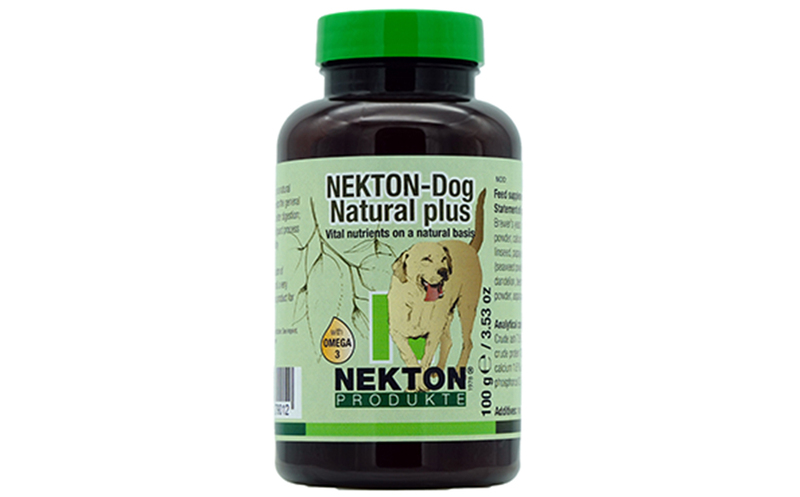 NEKTON-Natural-plus – the combination of vital nutrients is crucial!